Recently, a few lucky members of the Love Velo team spent a weekend fact-finding in Andorra. Since their return, they have not stopped talking about it. 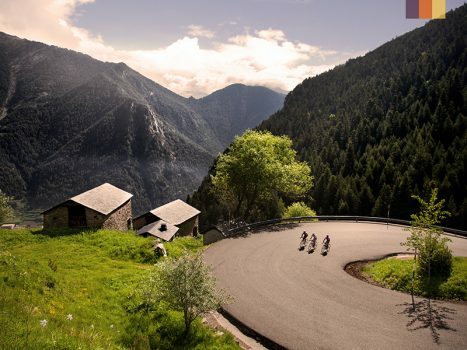 Nestled in the heart of the Pyrenees, the principality has so much more to offer as a top European cycling destination than its small stature would have you believe. Head down, lungs burning, legs on fire. You look up and see the sign at the side of the road: 5% gradient for the next kilometre. You breathe a sigh of relief, click up a gear and accelerate knowing the next part of the climb will be easier. Every kilometre of climbing has an information point letting you know exactly where you are on the climb, what elevation you’re at and what’s up ahead. There are even signs for the end of the Strava segment. It is evident that those responsible have thought about what a cyclist going for a new PB wants to see. The rest are for riders. Well, not quite but the vast majority of traffic is concentrated on the main highways which, because you won’t be visiting in the ski season, aren’t busy or difficult to ride. Once you’re off these it’s you, your legs and the eagles above you. We rode the Col D’Ordino, a 10km climb, and the first car to pass us was while we had a break at the top (after sprinting for the Strava segment). The guys at the Vallnord bike park know that while a ski resort sits quietly in the finer months, there are plenty of people crazy enough to hurtle down the side of the mountain. We had a quick introduction before we were carving down the trails and flying off the jumps. You’ll also find this to be the home of Andorra’s biggest bike brand, Commencal, and we were lucky enough to have Paul Commencal as our guide. Once you’re at the bottom you can head straight to the Gondola in town to get your cable car back up, or relax on the terrace of the Spot Bike Cafe and enjoy a well-earned beer and a pizza. When riding with the Andorran Cycling Federation, we were told that Andorra is home to 40 current world tour pros – not to mention the ex-pros and mountain bike pros that also live there. We were left in a state of shock as a red bull rider overtook us on the trails and disappeared out of sight in an instant. We spent a rest day properly, by visiting Europe’s largest thermal spa. It’s a maze of jacuzzis, hammams and saunas and is the perfect way to reset after working hard in the mountains. The views aren’t bad either! Follow the link below to take a look at the newest product on our website and give us a call to chat about why Andorra needs to be your next getaway.